At the beginning of the 20th Century, a new form of expression developed as artists began to distance themselves from the figurative representation of objects and nature as we see it. Instead, artists were content with depicting the world in only suggestive shapes on canvasses or they turned away from figurative motifs completely. For paintings in the living room or law firm, an abstract style can give the viewers a chance to let their imagination run wild and decide on their own interpretation. Not only does the interpretation vary between different people, it may even change according to the atmosphere or mood every time one sees it, to which abstract canvas paintings or abstract sculptures owe their depth of meaning. Show your free spirits and invite your visitors to stand by their own taste for abstract art. For it takes much courage to find your own style and we at KunstLoft will support you all the way! Are you interested in purchasing an artwork from KunstLoft as a gift to a dear friend or family member? The joy of art is not necessarily abstract, it can be a perfect gift that is crafted by hand and with love! 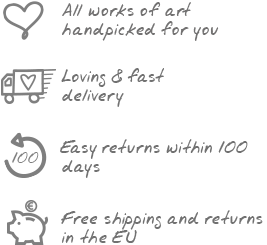 And should you or the recipient be dissatisfied with the artwork, we have a 100 day return policy and guarantee free return shipping. At KunstLoft you can find abstract art objects with motifs that really make you think. Our artists experiment masterfully with colour, form and contrast while abandoning any sense of order in painting and sculpture in the name of non-objective art. Prove your sense of style!